The World Health Organization (WHO) identifies non-communicable diseases (NCDs) as the worldwide leading cause of death, responsible for an estimated 61% of all deaths. In the United States, 87% of mortalities are caused by NCDs such as Diabetes, Cancer, Respiratory Disease and Cardiovascular Disease. In Australia, that rate is higher still, with NCDs accounting for 90% of all deaths. While these mortality rates seem stark, NCDs present a greater financial, emotional and social burden on those living with or caring for those with these often chronic diseases. Treatment associated with NCDs account for 48% of the global GDP. In 2010, the US spent $8,233 on health care per person as businesses lost considerable productivity due to NCD related illness. With expenses this high, it is no wonder that 60% of bankruptcies, most of which were filed by middle-class, well-educated homeowners, in the US are directly related to healthcare costs. Most upsetting perhaps, are the years of chronic pain and depression many people who live with NCDs face. Pharmaceutical treatment, like surgery, may not be effective for the majority of patients either. Statins like Lipitor, which grosses over $13 billion in globals sales per year, are prescribed to lower ‘bad’ cholesterol levels in the blood . Yet, less than 10% of patients who take statins, which cost around $4/day, will decrease their chances of having a heart attack, stroke, or dying. All will face potential side affects of the prescription. Surgery procedures and pharmaceutical medications are used as the go-to treatment for every other NCD from depression to obesity with limited effectiveness and varying costs. As patient spending on these treatments go up, and the rate of success for these treatments remains low, the global burden of these often chronic diseases will be more greatly felt. Although the challenges associated with NCDs that we as a global community face may seem insurmountable; high health care costs, decreased productivity of the global workforce, emotional isolation, loss of independence and physical pain are not the result of dramatic, unstoppable forces. The very root of NCDs can be found in the often overlooked banalities of our day-to-day lifestyle. It is estimated that 70% of health care costs in the United States are directly related to preventable behaviors like prolonged exposure to smoking, unhealthy diet, physical inactivity and environmental factors such as air pollution. The solution to NCDs seems simple, instead of relying on pharmaceuticals and surgery as treatment, we should prevent these diseases from ever existing by changing our habits. Nonsmokers who maintain a healthy weight, exercise regularly and eat a healthy diet are 80% less likely to develop the most common NCDs. The World Health Organization reports that population-based measures for reducing tobacco and harmful alcohol use, as well as unhealthy diet and physical inactivity, are estimated to cost US$ 2 billion per year for all low- and middle-income countries, or less than $0.40 per person. Due to an array of cultural influences, contradictory information about what constitutes a “healthy diet”, public awareness of how lifestyle affects long-term health and modern day stressors many people are still unable to maintain a healthy lifestyle. Leaders of national and local governments are taking on the burden of NCDs by investing in education about maintaining a healthy lifestyle, providing citizens with low-cost preventative health care and enacting laws that dissuade the unhealthy behaviors such as smoking, binge drinking and excessive consumption of sugar or high fat foods. These measures have shown to have varying degrees of success, sometimes sparking controversy and creating an opportunity for the private sector to work with academic health organizations to offer effective solutions to consumers and patients. Digital Health is a relatively new term for an emerging industry that provides interconnected health systems reliant on smartphone apps or smart-devices, communication technologies in crowdsourcing, social media and extensive data analysis to empower patients, consumers, and healthcare professionals in treating and managing illness, improving healthcare effectiveness and efficiency, advancing clinical education, managing healthcare risks, and bolstering the prevention of NCDs. In truth, it’s uncertain what the digital health industry will encompass over the next 5-to-10 years as applications to new technology emerges. Mobile health is often used interchangeably with digital health as mobile technology is a significant driver in the growth of this market. In 2010, the estimated number of people with mobile phones was 5 billion, more than the number of people with access to a sanitary toilet, and continues to grow each year. The opportunity a large-scale distribution of personal technology devices presents to businesses and consumers alike is infinite. In 2010, Parks Associates reported that the digital health market at $1.7 billion and projects a 27% increase to $5.7 billion by 2015. This may only be the tip of the iceberg as Co-founder of tech venture capital firm Andreessen Horowitz, Ben Horowitz, was quoted in the Wall Street Journal estimating that the wellness industry to be an $80 billion industry. Determining the size of a new market may prove impossible until the FDA outlines regulations for wellness apps. In the current “wild west” times of health and wellness apps, just about anyone can make an app that claims to treat or prevent illness. Because of the very real benefits these health apps and devices may provide some kind of FDA approval is needed. The extent of which right now, is still somewhat of a mystery. What we do know is that there is a real need for more efficient, effective and preventative health care around that world and that mobile technology is uniting our voices, data and innovation. Although there are considerable applications of digital health in NCD treatment, my project focuses on using technology to promote healthy behaviors associated with NCD prevention. This means creating new behaviors, ending or decreasing the intensity of specific current behaviors, and increasing the intensity of or pivoting other current behaviors. To do this, I have combined elements of neuroscience, behavior psychology and military operations into an 8-week online wellness program. The first step in creating a wellness program that utilizes new technology to create behavior change was to determine what behaviors to promote, shift, and dissuade users from engaging in. The 7 Body Brain Boosters are a set of wellness videos developed by Dr Roy Sugarman, a Neuropsychologist, and Professor Paul Taylor, an Exercise Physiologist, Nutritionist and Neuroscientist, to build mental, physical and emotional resilience in a fun, engaging atmosphere. Each of the 7 boosters focuses on a different aspect of wellness and behaviors associated with achieving health, vitality and happiness when faced with the challenges of modern living. All of the content provided meets the guidelines of nutrition, physical activity and lifestyle behaviors recommended by the World Health Organization to prevent NCDs. More over, each video shows how wellness behaviors fit into the average modern lifestyle. With this content for the site, the first step of the program was to support the different wellness goals of participants through a series of worksheets based on Self-Determination Theory (SDT) and the work of Dr. Kerry Spackman, a neuroscientist who works with elite athletes to mentally prepare them for peak performance. SDT suggests that individuals develop motivation for specific activities based on how well those activities meet the individuals need for autonomy, competence and relatedness. Autonomy is characterized by a feeling of control over our own choices; competence is a sense of mastery or confidence: and relatedness is the sense of belonging and satisfaction in social interactions. According to SDT, offering rewards or issuing guilt will only make a person motivated to perform the very minimum of a task for a short period of time. However, if the person finds personal satisfaction in mastering the challenge of that task, they are more likely to go above and beyond what is expected of them for a longer period of time. Between these two ends of the spectrum are feeling socially obligated to do a task and knowing that there are long term health benefits to performing that task. Dr. Spackman’s work, outlined in The Winners Bible (2009), focuses on changing peoples outlook and approach to getting what they want by creating an alignment between the primal and emotional modules of the brain with the logical modules. Dr. Spackman’s strategy employs writing goals down and then finding pictures and stories of these goals to integrate into your day-to-day lifestyle. The stories and visualization of these goals helps create a logical and emotional charge, and alignment to help people gain a clear focus of what they want and perspective of what is needed in their lives to get it. The two approaches fit together in that they give personal meaning to the goals people set. The Ballarat Wellness program applied these concepts by offering subjects a set of worksheets they can print off from the site. Aside from having subjects list their top wellness goals in the first weekly survey of the program, this was a highly personal exercise and as such, participants were not asked to share the result of this activity. Small rituals they can easily do everyday to support their goals. Subjects were asked to write out what their life would be like if they do or don’t make the behavior changes needed to reach their personal wellness goals. The subjects were encouraged to be as specific as possible in describing how difference aspects of their life will change as their wellness goals are achieved. Subjects were asked to list the issues or things that stress them out in their lives and then list a scenario of how they would ideally like to manage that stressful situation. Subjects are then asked to list ways that they can mentally rehearse and prepare for a healthy reaction to stressful situations. Subjects made a list the kinds of self-talk or inner dialogue that happens when they are in stressful situations, and finally write out what strategies work best for them to better deal with stress. Subjects were asked to place a value between 1 and 10 on each of the 7 Body Brain Boosters, where 10 is the highest value of personal importance and 1 is the lowest. Then, each subject is asked to place a value on satisfied they are with each booster in their lives right now. Lastly, subjects are asked to calculate the difference between the each booster’s importance and satisfaction in their life. By completing these worksheets, subjects gained a better sense of the complexities involved in accomplishing their goals and the reasons why it is personally important for them to do so. The biggest challenge these worksheets present is that deep self-reflection is the least enjoyable part of a wellness program. Self-tracking device companies like Fitbit or BodyMedia tend to focus their user interface on collecting and analyzing data on a day-to-day or per week basis. For a user to examine specific trends in their diet, sleep, and activities that resulted in weight loss, they must export spreadsheets of data that they then analyze themselves. No wellness website or health apps in my research, from Oprah.com to RunKeeper, were able to integrate meaningful self-reflection into a well designed, engaging user experience. Facebook has a great potential to offer a deep self reflection to its users, but it is rarely used as such. To date, the best tools for self reflection are keeping a journal or personal blog. With the proper coding skills, I would have liked to create a program that offer an interactive target for users to compete with, be inspired by, and reflect on. The target shouldn’t be visualized as a face or avatar, because users don’t always want to interact with human-looking technology. It could be as simple as a blue dot on a screen and act similarly to the iPhone Suri, in that you can ask it questions about health-related topics and it would search a respected database of information that help a user better navigate the deluge in wellness material. Instead of a weekly or monthly progress reports, the target would assess the user’s activity, diet, mood, sleep and medical history to point out what works and what doesn’t for that particular user, offering a set of realistic wellness goals for the next week/month. The targets would present these goals as competitions the user would play against it. That way a user has the tools to know if their nutrition, sleep, or activity goals are actually helping them or not combined with a personalized motivation to project their joys and frustrations onto. Using the technology available, the worksheets Paul Taylor and I designed offered value to users by providing self-reflective tools that were complementary to journaling or blogging by having users write out their thoughts and visualize the step-by-step process involved in achieving their goals. A central aspect of the Ballarat Wellness Program focused on how to direct the personal habits that contribute to healthy or unhealthy behavior by using concepts developed by Stanford Professor BJ Fogg and Charles Duhigg, author of The Power of Habit: Why We Do What We Do in Life and Business. The success of applying SDT hinges on maintaining a high level of motivation. But motivation, by its very nature is in constant fluctuation, making it impossible to maintain the highest level for a sustained time. Utilizing the concepts of habit change make it possible promote health behaviors without waiting to be inspired. 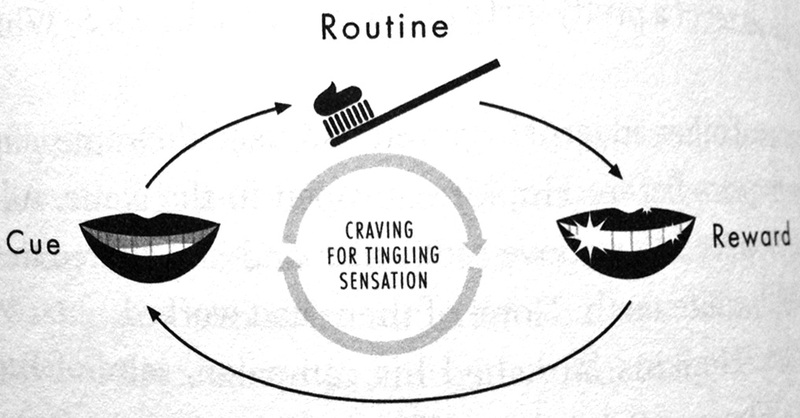 As Duhigg(2012) explains, habits are reoccurring loops of behavior consisting of a cue, routine, and reward. Driving this loop is a craving for the reward that is triggered by the cue. Cues and rewards can be emotional, physical, or a combination of both. To create a truly effective habit, the reward must immediately follow the routine no matter how large or small it is. An example Duhigg uses is the minty, fresh sensation we get as a reward after the routine of brushing our teeth. As a rule, habits cannot be completely destroyed, but redirected to or replaced with other habits. When changing a habit, the cure and reward can be the same, but the routine must change. For example, if someone has the cue of finishing a small task at work, the routine of taking a smoke break, and the rewards of getting away from their desk, going outside, and getting a energy boost from the nicotine; they can replace the smoke breaks with coffee breaks that provide many of the same rewards. Most importantly, as Duhigg notes, people must believe the change is possible. This deeply held belief is most easily created in a social setting, such as a support group or class because we are more likely to believe in something if others around us believe in it. The work of Dr. BJ Fogg takes a slightly different approach to the habit cycle by focusing on the triggers of a habit, the ability to perform them, and the immediacy of the routine. Like Duhigg, Fogg believes that when changing or starting a new habit, triggers or cues are usually the easiest to manipulate. By reducing or increasing the number and effectiveness of triggers, a habit is more likely to develop and affect behavior change. Fogg breaks triggers into two categories: hot and cold. Hot triggers are immediate and allow a person to engage in their habit’s routine right away, such as having a full water bottle with you if you are trying to create the habit of drinking more water. Cold triggers still create a craving for the habit’s reward, but are less immediate, such as seeing an advertisement for bottled water. Likewise, a person must have the ability to perform the routine without much effort or time for the habit to develop. To decrease a habit, someone must decrease the amount of triggers and make it more difficult or longer to complete the routine. If the ability to perform a habit is difficult, it is still possible to do, but will rely on the fluctuations of motivation to do so. Dr. Fogg also examines the role that motivation plays in people’s ability to perform the routines of their habits. Simply put, if someone is highly motivated, they are able to do harder tasks that take longer with few triggers and less ability. For this reason, it is ideal to pair a highly motivated person and a hot trigger. But when the person is not highly motivate, they will depend on hot triggers and small habits that feed a larger behavior change to be effective. For example, when creating a new activity program a person can set challenging goals for when they are highly motivated, but also set small immediate goals like taking one flight of stairs instead of an elevator. The small routines must be finished in under a minute and have some kind of small reward. This concept of small habits and immediate rewards fit into the Ballarat Wellness program through the use of the Fitbit. We recommended that users walk about 10,000 steps a day and offered examples of how to accomplish this goal by taking a few more steps here and there throughout the day. When users were close to or had accomplished their daily goal, I would use the Fitbit interface to cheer them on as a small, social reward for their work. If a user showed that they had a lower motivation in their weekly survey, I would tend to cheer them on even if they did not reach their goal. Just using the Fitbit was enough of a healthy habit to reward. Hot triggers can also be applied to online engagement. By posting links to new BallaratWellness.com posts or the weekly surveys on the Fitbit site and in emails, users were more likely to click on them an engage in the site for 30 to 60 seconds without having to be very motivated. The more hot triggers for engagement that are offered to users with the program through social support, online links, or simply by wearing the Fitbit itself, the more likely they are participate in the program. Although creating or replacing habits can be a low cost, scalable, and effective way to promote healthy behaviors, and in turn a healthy culture, it is no silver bullet. When someone is in an unusual or stressful situation, their habits are likely to dissolve. While this response is a healthy reaction to a potentially dangerous situation where critical thinking is vital to success, it is not ideal when stressful situations or irregular circumstances are common. Furthermore, the cravings for the original habits never go away. This is why having a deep-seated belief in the habit and goal that the habit achieves is so important to creating a change in behavior. provide the tools and services for people to have empowered interactions with their personal data. The concept of gamification is fairly simple: offer ways for users to interact with a site or other users on the site in competitive, game-like ways. The aspects of competition, or the act of winning or losing, increases engagement by activating two basic dimensions of human personality: Behavior Inhibition System (BIS) and Behavior Activation System (BAS). The BIS is sensitive to punishment, non-reward and novelty. The response caused from BIS is a motivation to avoid negative or painful outcomes. Some personalities find a greater motivation from their BIS responses and sites like Dietbet.com or Gym-Pact.com where users lose money if they do not engage in healthy behaviors. Others find a greater motivation from a BAS response and sites that reward the user or society with money, prizes, social rewards, or badges like Earndit.com or Badgeville.com. Although we offered links to different BIS-focused sites to the Ballarat Wellness study subjects, our program focused on BAS response motivation engagement. Understanding how ideas, emotions, and behaviors are passed through a social network connects the concepts of habit formation, SDT, BIS/BAS, and personalized data analysis. The social integration of a wellness program is the most efficient way to spread ideas and behaviors to a larger audience by offering ways for users to share their online experiences to their contacts. More importantly, it offers users a personal support system and companionship through the often difficult process of making small, but significant lifestyle changes. Through this process of spreading and connecting, social network integration creates a higher intelligence by crowdsourcing the analysis of personal data. When cancer patients or people trying to lose weight are able to accurately share and compare what strategies have worked for them, the entire medical community can benefit. This new field of open-sourced healthcare is still in its infancy and has yet to be fully embraced by health care providers. But as technology continues to further our ability to analyze personal data and then share that data with others, the crowdsourcing of healthcare will only become a more effective, scalable wellness solution. Early studies on the effectiveness of integrating activity monitoring devices and social support have shown to be beneficial, sparking further venture capital investment in digital health technology, an annual US Surgeon General “Healthy App” award, and the creation of countless health apps based on faulty science. As federal regulation of digital health technology increases, there may be a fluctuation in the private sector’s investment and how healthcare insurers and providers utilize these tools. Regardless of change in this emerging industry, it critical that new technology and behavior change theory can empower consumers, patients, and healthcare providers to solve the often chronic challenges that non-communicable diseases bestow on society. I look forward to playing an active role in the integration of design, entertainment, and technology that improves scalable preventative health programs in the years to come. 16 Mears, J., & Kilpatrick, M. (2008, January/February) Motivation for Exercise: Applying Theory to Make a Difference in Adoption and Adherence. ACSM’s Health & Fitness Journal, 12:1, 20-26. 17 Spackman, K. (2009). The winner’s bible: Rewire your brain for permanent change. Austin, TX: Greenleaf Book Group Press. 18 Duhigg, C. (2012) The power of habit: Why we do what we do in life and business. New York, NY: Random House. 19 Carver, C.S., & White, T.L. (1994). Behavioral inhibition, behavioral activation, and affective responses to impending reward and punishment: The BIS/BAS Scales. Journal of Personality and Social Psychology, 67, 319-333.